In The Eye Of A New Storm: How Is Nokia Doing? In the 6 or so months since Stephen Elop was announced as CEO of Nokia the stock is about flat. That's not to say that the stock hasn't actually budged - from the day of his appointment until the announcement of the partnership with Microsoft around Windows Mobile, it was actually up about 40%, to about $11.75. It's now at $8.66, although it's been under $8 as recently as the end of March. 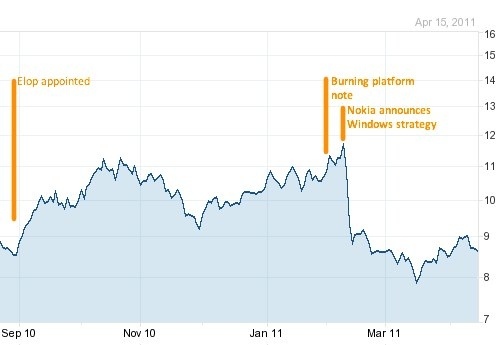 Nokia is down 16% year to date, 21% in the last 3 months and 42% in the last year. The Economic Times said yesterday that Nokia is considering selling a controlling stake in its money-losing JV with Siemens (my Prescription on March 26th suggested that they sell the whole thing). The Wall Street Journal reported the same story suggesting that one of the blockers will be an outstanding pension obligation. Nokia's FD is quoted in the WSL as saying the story is "untrue". The Gulf Times reports today that as many as 6,000 Nokia employees are at risk of being made redundant, with a significant reduction expected in R&D staff as I suggested in the same Prescription. This week Nokia announced its latest Symbian phone (v3.0, known as Anna I gather, of the operating system), the X7. Apparently it will soon be replaced by an equivalent Windows Phone, cleverly named as the W7. I suggested that Nokia come up with a new naming convention - I'm already baffled by the E6 (a business related phone apparently - e for Enterprise? ), the X7, the W7, the C7 and the C6-01 not to mention the N-series. Another site promoted the rumour that there would be at least 12 Nokia/Windows devices in 2012. IDC announced at the end of March that Windows phone would have the number 2 share of the mobile operating system market by 2015 (Android would have 45%, Windows 20%, iPhone 15%). This would all be driven by the Nokia partnership. No mention is made of tablets, revenues or, importantly, profitability. Meanwhile a customer satisfaction survey by JD Power showed Nokia coming 4th behind Apple, HTC and Motorola with its best score on battery life - always a strong point of Nokia and something that it may perhaps struggled to maintain with Windows as its operating system. Digital Trends floated the rumour that LG and China mobile may adopt Meego - an apparently dead end platform as far as Nokia is concerned. Meego is open source so they would, in theory, be free to do that (Digia bought the library on which much of MeeGo and Symbian are built in March). Nokia publishes its interim Q1 report on 21st April so we will find out whether the announcement of the Windows move deterred any customers from buying phones. Goldman Sachs thinks Nokia is a buy with a target above $12, Moody's downgraded its long and short-term debt, Nomura thinks the stock will fall 30% or more from where it is today, HTC's new Sensation phone looks to outperform Nokia's X7 and the median stock price target is about $9.25 - above where it is now plainly, but not likely to be a stellar performance. I'd like to see Nokia unveil a clearer plan - perhaps like my prescription or an entirely different one. Waiting until 2012 before we see Windows phones doesn't seem like a good idea - and in the interim the only headlines will relate to lay-offs, budget cuts, sales of units and other negatives, all of which will drive away customers and so put the stock in negative territory. Mr Elop has a big job ahead of him. Let's hope he's not like the CEO of Microfocus who departed after less than a year on the job this week, with the stock price having fallen 41%. Instead he'll be hoping he's more like Bart Brecht who say the shares of Reckitt Benckheiser lose $2bn in value upon the announcement of his departure. Where Does HMV go from here?